Chinese President Xi Jinping is calling for better relations with Washington to help prevent what he said would be disastrous conflict between the two nations, as he begins his week-long tour of the United States. 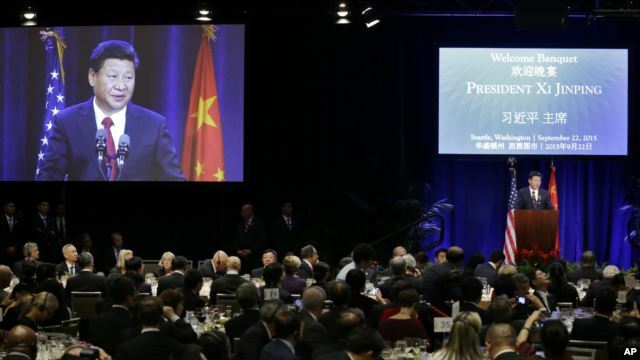 The comments came Tuesday during a much-anticipated policy speech to business leaders in Seattle, the first stop on a trip that will culminate later this week with the Chinese leader's first state visit to the White House. "If China and the U.S. cooperate well, they can become a bedrock of global stability," Xi said. "Should they enter into conflict or confrontation, it would lead to disaster for both countries and the world at large." The Chinese leader also addressed a wide range of other issues that have upset U.S.-China ties, including cyber hacking, which President Barack Obama has said will figure prominently in their one-on-one talks. "The Chinese government will not in whatever form engage in commercial theft or encourage or support such attempts by anyone," Xi said, repeating Beijing's assertion that it is the victim, not perpetrator, of such attacks. China is willing to set up a "high-level joint dialogue mechanism with the U.S. on fighting cybercrime," Xi said, in an apparent attempt to reassure business leaders alarmed about the growing threat of cyberattacks. He also said China will not lower the value of its currency to boost exports. That is a longstanding worry among many U.S. officials, made worse by Beijing's surprise recent devaluation of the yuan. Xi and Obama are expected to have intense talks about cyber espionage and economic issues during the Chinese leader's state visit to the White House on Friday. 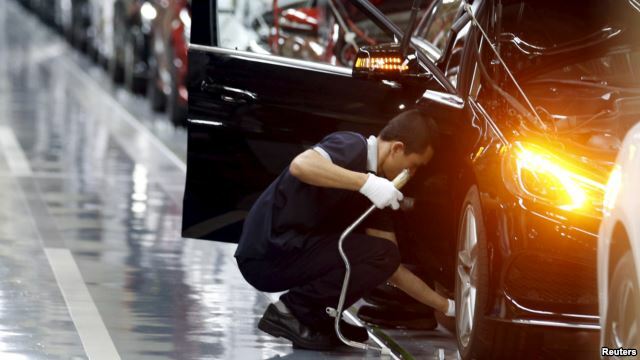 The U.S. will press China to avoid "quick fixes" for its economy such as devaluing the yuan to help its exporters, White House chief economist Jason Furman said Tuesday. Furman said China's recent loosening of controls on the yuan "caused turmoil" in global financial markets and that U.S. officials also would raise the issue of China's volatile stock market. Ahead of Xi's visit, top U.S. officials have been more vocal about condemning Beijing-sponsored cyber espionage, calling it a major stumbling block to U.S.-China relations. "We are increasingly hearing concerns about activities that the Chinese been engaged in," said U.S. Deputy National Security Advisor Ben Rhodes. "So we want to make it very clear this puts at risk China's ability to continue on its growth if businesses don't have confidence they won't be subjected to cybertheft." U.S. officials have suggested imposing sanctions on Beijing, and the president said Washington is preparing "a number of measures" aimed at showing Beijing that "this is not just a matter of us being mildly upset." Another area of possible disagreement is China's controversial territorial claims in the South China Sea. In his speech Tuesday, Xi stressed that China does not want confrontation with other nations, and does not want to impede freedom of navigation in the region. "Let me repeat: No matter how developed it becomes, China will never seek hegemony or seek expansion," he said. China has been carrying out land reclamation projects, as well as building civilian and military facilities, in the Spratly Islands chain, parts of which are also claimed by the Philippines, Vietnam, Malaysia, Brunei, and Taiwan. "China's development and maintenance of facilities on some of our garrisoned islands and reefs in the Nansha islands does not impact on or target any other country, and it should not be overinterpreted," Xi told the paper. China's human rights record is another source of friction with the U.S., and the topic is likely to come up throughout Xi's visit. As the Chinese leader spoke Tuesday in Seattle, dozens of protesters gathered nearby to condemn what they see as Beijing's harsh policies in Tibet and its crackdown against other political dissidents. He is also likely to experience protests in Washington, where several groups plan to hold demonstrations near the White House, and in New York, where Xi plans to address the U.N. General Assembly. National Security Advisor Susan Rice said earlier this week U.S. officials will continue to push China to stop detaining activists, to allow more freedom of speech, and to eliminate restrictions on religious practices. But similar statements in the past have been dismissed by Beijing, with little noticeable progress. And there is no indication that Obama intends to give human rights concerns any more priority in the current meetings. "It's absolutely true that it's a big and complicated relationship, and so there are a lot of topics vying for attention," acknowledged Sophie Richardson, China director at Human Rights Watch. "But we certainly think that the deterioration of the rights situation in China under Xi merits special attention." "We also try to remind people that the same laws and independent institutions in China that would better protect human rights, like an independent court system, respect for the freedom of expression, are also essential to a healthy trade relationship and better diplomatic partnering, and many other aspects of the relationship," she told VOA. Eight people, including four believed to be ethnic Uighurs, have been detained in Malaysia for questioning in connection with last month's bombing of a shrine in Bangkok that killed 20 people, a senior official said Wednesday. 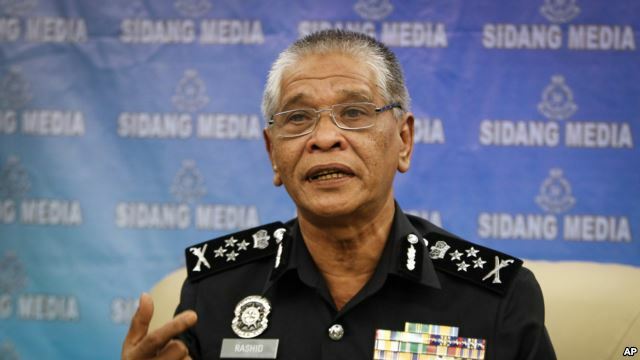 Four of the eight were Malaysians involved in human trafficking, while another four were believed to be Uighur men who entered the country illegally, he said. While there is no evidence they were directly involved in the bombing they are being investigated to see if they had any role in other activities surrounding the blast. “Right now, there is no concrete evidence to show that they are directly involved,” Noor Rashid told reporters. He said Thai police have been notified, and he hopes they can aid in identifying the men. Thailand will need to provide basic proof of their involvement in the bombing if it wants to extradite the suspects, he said. Noor Rashid initially said the Uighurs had no documents on them and that their only offence was entering Malaysia illegally from Thailand. However, he later said they had passports but it was unclear if they were genuine. He didn't give further details. In Bangkok, Thai Police Chief Somyot Poompanmoung said he has not received any confirmation from the Malaysian police that the suspects were involved in the blast. Thai authorities have arrested 2 suspects they say were linked to the bombing, but believe the actual bomber and the mastermind of the plot have fled the country. Thailand has suggested that those behind the blast may have been from a gang involved in smuggling Uighurs from the Chinese region of Xinjiang, while others speculate they may be separatists or Islamist extremists angry that Thailand repatriated more than 100 Uighurs to China in July.